As if the life I’ve been living wasn’t blessed enough, I decided to make it complicated, by adding project after project. It’s not something I’m doing on purpose, but it’s more of what has to be done. Sometimes we overload our plates emotionally, physically and mentally. Well, I was brought up the old-fashioned way and my mom taught me to work for I want. If it needs to be done, just do it. 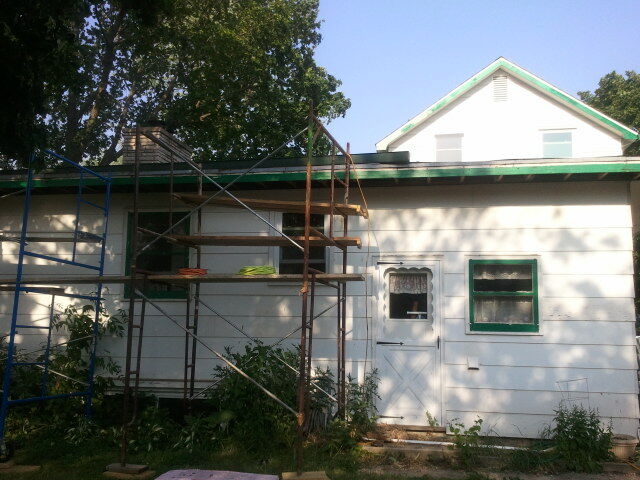 So with the help of my awesome husband, we’ve decided to do the craziest thing and remodel our old 1890 farmhouse. Even though I enjoy decorating and putting things together to give a room its own identity, I’ve had to learn that remodeling takes a lot of patience. If you’re interested, I would like for you to join me while we try to get this house remodeled into a more updated home without losing its country appeal. Throughout the years, it has been added on to or adjusted to fit the previous owners taste. The last update before us was in the “70’s”. It was fitted with all the flair from the shag carpets, fleck tile, and seafoam green fixtures. The original foundation was built on what was a crawl space. To make it a full basement they had to raise the house allowing enough room to stand, and installed the oil furnace and tank. My kitchen has been the most nerve wracking for me. The cabinets were custom built and stained birch plywood. Over the years, there was water damage and we later learned that instead of just refurbishing them, they would need to be replaced. The eat-in kitchen originally sat a table for two. Its walls were painted a shade darker than tangerine and at one time the pantry was a bathroom. The custom-made china cabinet and linen drawers were also birch plywood. It created a tunnel between the kitchen and the hallway to the main bath. All the cabinets and vanities throughout the house were built in place and secured very well. This made the removal difficult. We joked that he built this house to withstand a tornado, and now he’s haunting us because we’re tearing down his hard work. In our master bedroom there were no heating ducts installed. The only thing that was in the there was a big clunky ac mounted through a hole in the wall. Our son’s bedroom had a door to nowhere. It literally opened out to the roof where a second floor sun deck was intended but was never constructed. Join us as we turn the page in this house’s history. For the next chapter let’s start with the flood of 2008.